The robot of justice who came from outer space! A robot who arrived from outer space while chasing a form of Evil Energy. Although his true character is not entirely known, because of his loathing of evil and strong sense of justice, it’s a good guess that he’s probably some kind of space police force officer. 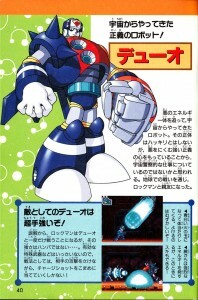 Through the course of the battle on Earth, he and Rockman became good friends. As an enemy, Duo is super tough! Due to a misunderstanding Rockman and Duo engaged each other in battle for the first and only time, but Duo may have used only a fraction of his strength…. 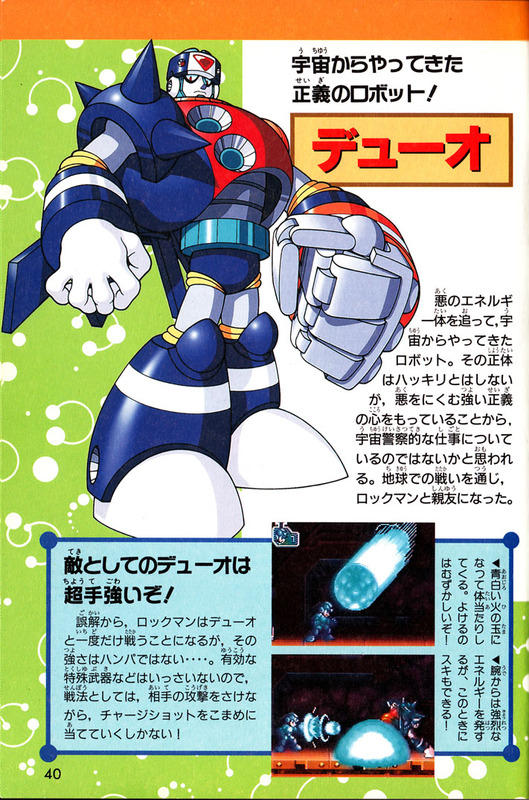 All of Rockman’s special weapons are useless against Duo, so the best tactic is to dodge his attacks and counter with the Charge Shot! This crash attack involves transforming into a pale blue shooting star and ricocheting around. Talk about difficult to dodge! When he fires an intense blast of energy from his arm, you’ll have a chance to counterattack! 5 Comments to "Intergalactic Officer of the Law"
I've heard many humors of Duo being a intergalactic officer… so that's where it came from. But as it says, "he's PROBABLY some kind of space police force officer", which can be seen as just a comment or Duo really being one. As mysterious as Serges and Isoc being Wily? So here's where "Duo is a space cop" was more or less confirmed. This isn't really the only place that says so, this is just a page I picked to scan. I remember the first time I heard about Duo's connection to pigs in space was from an interview with Inafune, which is what I was referencing above. I don't remember the whole interview. I think it was by Planet Mega Man (back when there was one), but I don't have a copy of it anymore unfortunately. I think Duo's background is one of those ideas that are in play but not expanded upon. Like, where is Duo's home planet? What is the race who created Duo like? Is Duo alone in his fight against Evil Energy, or is he a part of a huge organization that fights all sorts of galactic criminality? And where are Duo and his people for the entire rest of the time line? There aren't any solid answers to these, so all we have is the rough concept to content ourselves with or let our imaginations go wild, and I think that's the long version of what they're saying in these books. Interesting the part that says that Duo probably has used only a fraction of his power against Rock. Anyway, it makes sense. From what we can see in the first cinematic of Rockman 8, Duo can move faster than light and is probably a planet buster. background you might be able to give on these characters? That’s from Heat Man’s transcription of the Planet Mega Man’s 2003 E3 interview with Keiji Inafune. I knew I read it somewhere before! Thanks, you-know-who!